Great shots! I do love wine tasting and wineries....now I want to go again! Laurel-Rain Snow - We will try to visit again in the fall when the leaves are changing. I absolutely LOVE that logo! Puppies and wine...it doesn't get any better than that! Sandy - Agreed! I should have included a photo of the glass, too. What a great idea about the dogs + wine, something my boss would appreciate, and he doesn't appreciate much except for Dogs and Wine!! Love the scenery, makes this once New Yorker whimsical. Come see my snapshot for today. Marie - Ha, sounds like he might be difficult to work for ;-) The Finger Lakes in such a beautiful region... too easy to take for granted when you live nearby! 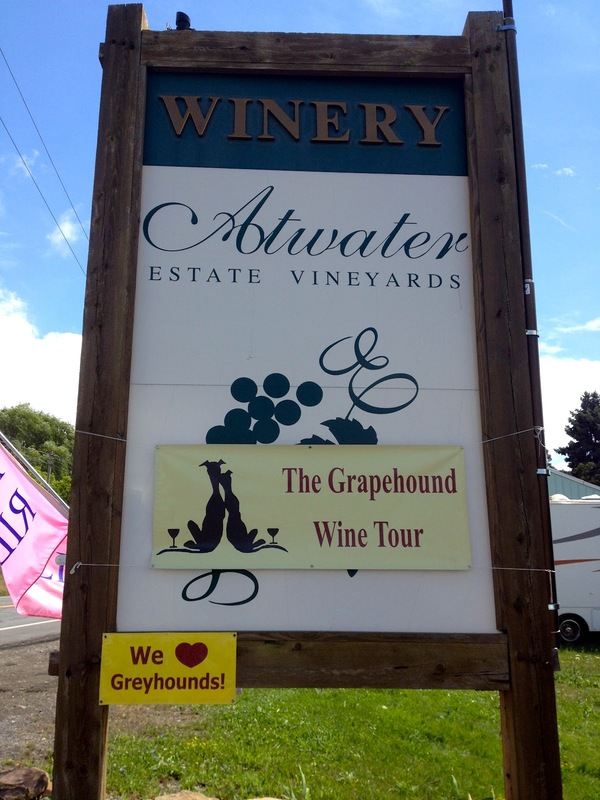 Greyhounds and wine seem like an odd mix, but it sure looks like it worked! The logo is so fun! Joy - I probably should have included a photo of the glass, too! What a fun way to celebrate greyhounds! Kathy - All the proceeds go to local greyhound adoption groups and animal shelters. I agree dogs and wine go together nicely. Great photos! Looks like a fun event. Book Savvy Babe - It really was. Thanks for visiting! 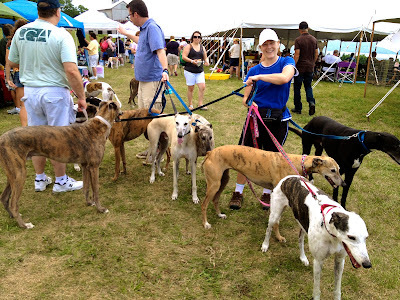 What a cool event, and a great way to raise awareness about greyhound adoption. Leslie - Yes, it takes quite a bit of time and money to get retired racers to their 'forever homes'. That is such an unusual pairing, but I think that image with the wine glass and greyhounds is awesome! Alyce - I really love that logo... should have included a photo of the glass, too! Looks like a fun event! Thanks for stopping by! Srivalli - It was, thanks! Great photos! The setting is beautiful and so are the greyhounds! Rebecca - Thank you. We had a 'greyt' day. IT looks as if you all had fun, with a serious purpose - are the greyhounds former racing animals? Christine Harding - Yes, they are all former racers. Our dog, Zelda, was not very good at it and was lucky to find a home before she was 3 years old. Sounds like a really fun event! That was an inspired pairing. Eugenia - The whole family had a great time! What beautiful greyhounds they are... and the scenery too. THanks for sharing something that's very unique in your vicinity. 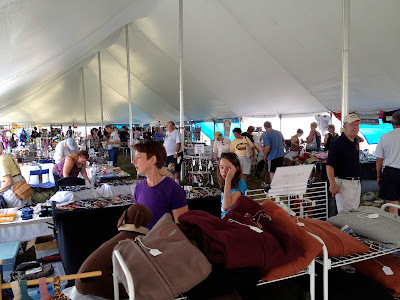 Arti - I have since learned that this organization also sponsors an annual spring event in Virginia. Greyhounds are everywhere, lol! There are places around here for wine tasting and I have never really done it. Considering people travel all over the world for this, I really should take advantage of my own backyard! Kailana - You should definitely go. 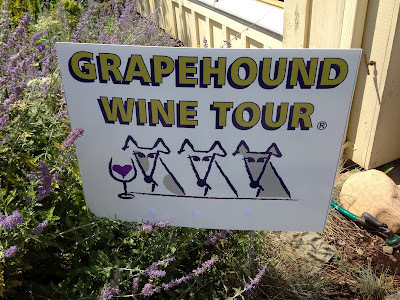 Even without dogs, wine tasting is a lot of fun! Paws and wines seem odd combination but many love both. Very nice photos. Edgar - Definitely an odd combination... I've never seen anything like this before. Fun event! Like the combo of dogs and wine. 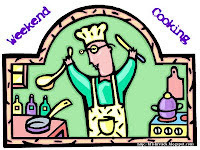 You should consider linking this up to Weekend Cooking. Photos count! Paulita - It really was an amazing day... and all for a good cause, too! Looks like a gorgeous day! What a fun event, for everyone including the pups. Carol - The dog slept all the way home... think all that socializing tired her out! An excellent event! It's nice to see greyhounds coming into the mainstream. They have been exploited for so long and are such a nice breed. Also ... that area of NY is so beautiful! Our daughter went to Hobart & William Smith College ... right on the lake. We loved visiting her! Susan Lindquist - What a coincidence - our daughter just graduated from HWS in May! It's not too far away from us, so we were able to visit often, too. This was a wonderful event and it was fun to spot greyhounds all around the lake. Ah, wine tasting. One benefit of living where I live is fairly easy access to vineyards. Husband and I occasionally drive up to the Central Coast or Napa for a few days to relax and imbibe. It looks like fun! 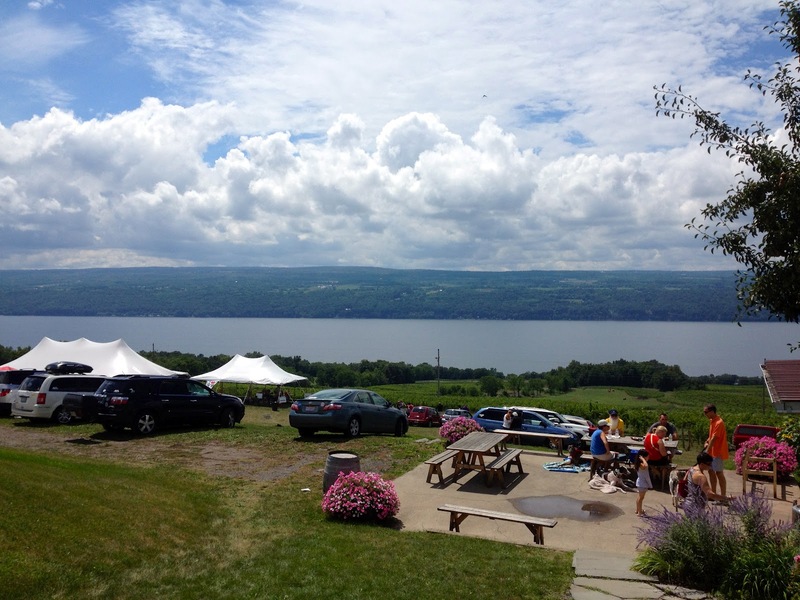 We are heading to the Finger Lakes next weekend for a week. I sure would like to get in a visit to one of the many finer wineries there. Bookchickii - The quality of Finger Lakes wines and wineries has improved dramatically over the years... hope you have a great week! Wow, that looks like a great day. I've never seen that many greyhounds not on a racetrack! Nice to see. 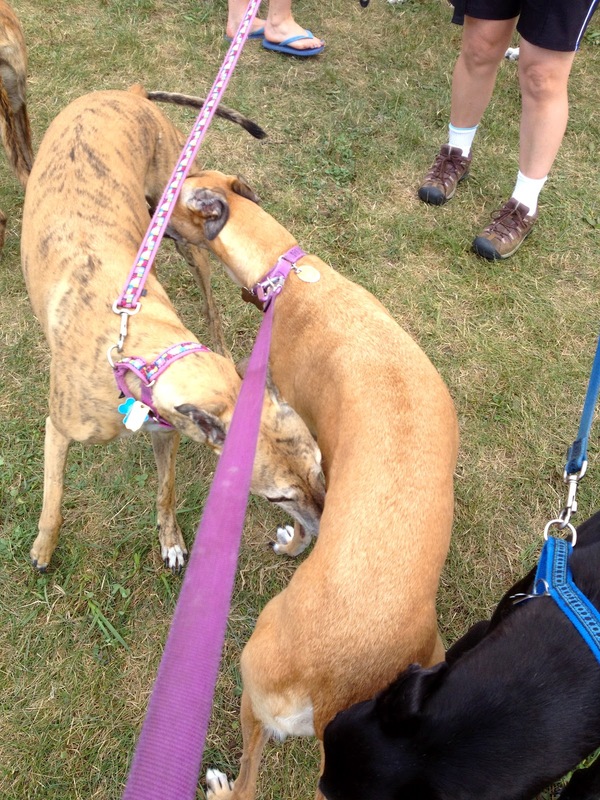 Louise - It was truly wonderful to see so many greyhounds leading happy lives as pets! What a wonderful event. I bet you had a great time. Carol - We sure did! Joann, I'm really late in visiting your Saturday post, but oh wow would I have liked to join you. Great shots. Thanks, Diane. We had a great time and it was such fun to see so many greyhounds enjoying life as pets. Look at all those greyhounds!! I'm glad you guys had such a great time--and it looks like Zelda did as well. I think that is an amazing event!! Look at all of those wonderful greyhounds!!!! Staci - It was an excellent day and we're already looking forward to next summer's event! This sounds absolutely amazing and delightful! Very neat. Are other dogs invited as well? Care - There were several other breeds there, but most came with a greyhound 'sibling'.